Tech companies have recently ratcheted up their offensive use of intellectual property, especially in the mobile space — but not so much in social networking. Just in case patent wars happen to be contagious, it seems worth evaluating which social networking players are best-equipped. I wrote on Wednesday about a Silicon Valley entrepreneur who is hopeful that Google may pursue some of the patents and patent applications he filed on behalf of a company he started that Google later acquired. Also on Wednesday, on the occasion of Facebook filing to go public, two patent researchers from Envision IP posted a good summary of the distribution of social networking patents among tech companies. 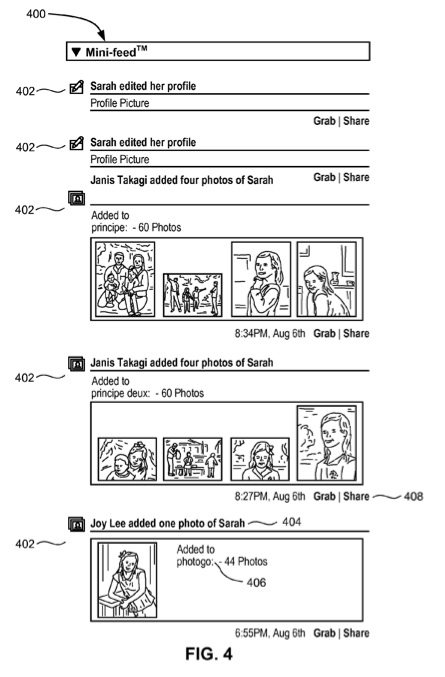 This Facebook news feed patent lists Mark Zuckerberg as the first inventor. Facebook’s patents cover inventions created at the company, like its news feed and some privacy features, as well as some additional intellectual property it acquired. The biggest patent acquisition deal Facebook has done was with MOL Global, for the Friendster patent portfolio of seven patents and 11 patent applications in May 2010. That cost $40 million — something insiders considered a steal, given the risk of the patents falling into someone else’s hands. The Friendster patents cover topics like making connections on a social network, friend-of-a-friend connections through a social graph, and social media sharing. At Facebook’s most recent internal valuation, the stock alone spent on the Friendster patent deal is now worth more than $100 million. Google: Though Google hasn’t been a major social networking provider for all that long, it has 25 U.S. patents and 40 pending U.S. patent applications on the topic, by Envision IP’s count. Google has aggressively hunted intellectual property about social networking. As I referenced earlier, it got a patent portfolio through its acquisition of the Dealmap (previously Fatdoor). That includes patents and patent applications on things like regions of influence within users of a network. Last year, Google also acquired some patents from the shut-down social search engine Wowd, including one on user-driven ranking of Web pages. In an interesting twist that resulted from a three-way split of Wowd’s assets, Google currently licenses those patents to Facebook. Backstory here. 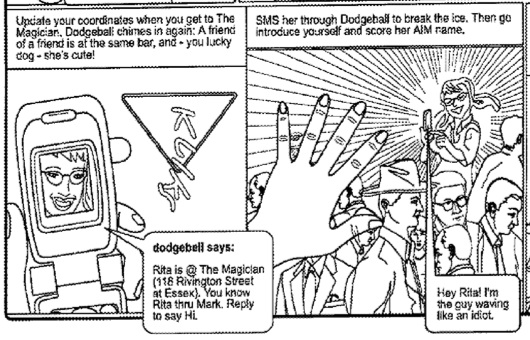 Back in 2005, Google also bought Dodgeball, the mobile social application created by Dennis Crowley, which predated Foursquare. And it turns out that because of Dodgeball, Google is assigned what looks to be a broadly worded patent on “location-based software for mobile devices” that describes messaging between two users who are in close physical proximity to each other. The Six Degrees patent: Back in 2003, Reid Hoffman and Mark Pincus paid $700,000 in an auction for a seminal patent from the failed social network Six Degrees, in part to keep it away from Friendster’s control. Hoffman recently told me that he and Pincus bought the patent as individuals, and then assigned it to their companies, LinkedIn and Tribe.net. Apple, Yahoo, Microsoft, IBM: Envision IP notes that Apple has 35 U.S. patents and 76 U.S. patent applications that seem to be about social networking and collaboration, many of them focused on mobile. Yahoo has an armory of patents on all sorts of general Web technologies, while Microsoft and IBM have about 80 patents on file sharing, messaging and infrastructure that could be used for social networks. LinkedIn and Twitter: LinkedIn has one patent, on evaluating user reputations within a social network. Twitter doesn’t seem to have applied for a single patent (at least, not prior to 18 months ago, since that’s the period after which patent applications are published). What are the other pockets of social networking intellectual property out there, at other companies and around the world? I’m sure I’ve missed some, so please add to this list in the comments.